The civil rights movement of the 1950s, 1960s, and 1970s was one phase in the longer black freedom struggle that began when the first Africans arrived in Virginia in 1619 and continues today. 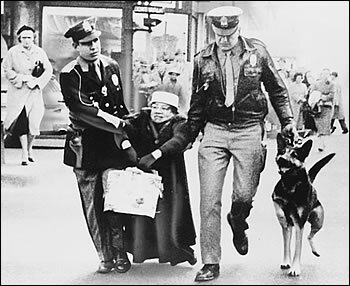 Much of the civil rights movement was seen on television. Because the most notorious events and horrific images were from the Deep South, Virginia's role in the movement tends to be overlooked. It was in Virginia, however, that the National Association for the Advancement of Colored People (NAACP) filed more lawsuits than in any other state, and Virginia's program of Massive Resistance, though ultimately futile, showed how to slow the march for integration to a crawl. Civil rights attorney and activist Henry Marsh recalls that "the rest of the Southern states were sort of watching Virginia to see what would happen. We had to rise to the occasion. We had the strongest group of civil rights and NAACP fighters of any state in the union because that's where they chose to make a stand." Hence, many of the most important legal landmarks of the civil rights movement originated in Virginia. Irene Morgan brought the suit that desegregated interstate bus travel in 1946. Another Virginia case extended this prohibition against segregation to include interstate bus waiting rooms and restrooms. One of the five school desegregation lawsuits decided by the momentous Supreme Court decision of May 17, 1954, resulted from the student strike at Moton High School in Farmville led by teenager Barbara Johns. The case of Green v. School Board of New Kent County became the most important school desegregation decision since 1954. Southern juries were desegregated as a result of Johnson v. Virginia in 1963. Richard Perry Loving's case resulted in the overturning of seventeen states' laws banning interracial marriage. The Civil Rights Movement in Virginia was organized by the Virginia Historical Society and cosponsored by the Department of Historic Resources with additional grant support from Philip Morris USA, the Jackson Foundation, the Virginia Foundation for the Humanities and Public Policy, and the Honorable and Mrs. Elliott S. Schewel. The civil rights movement did not achieve all of its goals. But Jim Crow—the social system of legally sanctioned segregation and second class citizenship—is gone. A better, more just society, replaced it. The civil rights movement was as revolutionary in changing Virginia as was the War for Independence in the eighteenth century and the Civil War in the nineteenth. Learn about Thomas Jefferson and his role in writing the Declaration of Independence. Read about Richard Evelyn Byrd, a hero from the 1920s.